Google Ads advertising medium on the internet to advertise a product, business, or your campaign in any format. One of them is in the form of text or writing. Text ads are Google Ads ads that most standard and most commonly appears on the compound in the Google search results. Text ads generally contain the link to your web site or even it could be an email or a phone number, and a description of your site's content in simple language and precise. 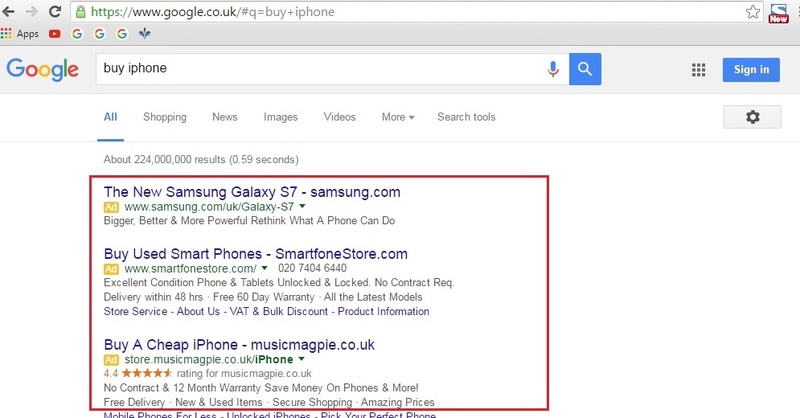 Ads not only appear on Google search results pages but also can run across all of Google's network, for example Youtube. Although it may look different display format on the network or on the mobile. Internet users who read the text ads you will be able to know that the text is marked with a paid ad for a particular language. All ads adjustment can be done in your Google Ads account so that ads can be aired in accordance with our wishes as an advertiser on Google Ads. Ads that begins with a title that is also a link or links from your online site and can be clicked by internet users. Then underneath there are one or two lines of text for a description and the address of your site is written in green. When you advertise on Google Ads there are several components that determine the quality of your ad and make the overall effective advertising to attract users to click. By understanding these components you will have a guide to composing text ad quality. Quality ads based on the relevant pages, quality score and the offer price for your ad to be aired in positions 1-3. The title is the first component to be first seen by people. Therefore make the title links that contain keywords and make people interested to click. The second component is the display URL will be marked with green color in the ad text. This URL is to show the user a page that will open when the link is clicked on the title. The description is a component of AdWords ads that provide brief information on the business or the content of your site. To view the mobile version of Google Ads ads will typically cut the second line description for ad space is limited. Writing text ads that quality is an obligation that Google users are tempted to click on your ad. Once you determine what kind of targeted consumers, the next step is to create a text ad on Google Ads specific, relevant, and interesting to get a lot of clicks. What is the added value in your business compared to other businesses. Include these advantages in your text ad description. Products that are no promotion is certainly more attractive for users or prospective customers. If you are having a party discount, free shipping costs, or other bonuses, this could be your value in the eyes of consumers. Tell me what should be done by the consumer to be able to get the product from you. Words such solicitation eg register now, or buy mumpung stocks are still there, and so will assist consumers in taking action to be taken. Effective text ads are ads that are relevant to keywords typed. Therefore enter your target keyword in the title or description so that consumers may be more interested to click on your ad. This match between the link text ads with the opened page of course also be an important factor. If your ad mentions a promo discount but when the consumer opens the page the link and found no signs of promo consumers will abandon you. Add your text ad extensions at the office or store such as the address, phone number to call, and so on. It will provide information that is clear and easy to get to the see the ad and show that your business is not a fictitious business. Additionally consider creating an ad on a mobile version as well as Google Ads ads may look different in the mobile version. Avoid errors in writing ads that can degrade the quality of text ads on Google Ads. Some common errors in text ads are spaced more, capitalization irregular, and URLs that are not clear.